Situated on the west coast in the traditional village of Peyia. Stunning views of Coral Bay. Only 25 minutes drive to the lively resort of Paphos. Sleeps up to 6 with 2 large bedrooms and a large sofabed in the living room. 2 balconies (1 sea view with sunset, 1 pool view with sunrise). Large open-plan lounge/dining room with Sony Bravia LCD TV and DVD player. Plus wifi and internet TV with all uk channels, unlimited movies and sports! Fitted kitchen with cooker, hob, microwave, washing machine and fridge/freezer. Large ceiling fans in every room with option of air conditioning in all rooms. 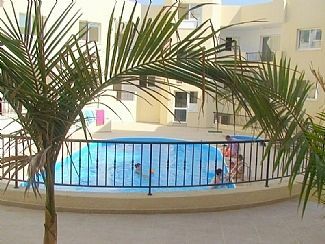 Large communal swimming pool and Jacuzzi and covered parking area. Baby/child friendly with travel cots, high chair and baby bath. Tennis courts nearby & 5* golf courses within 15km (see activities page). Peyia village is 6 mins walk away with a bakers, a butchers, a fishmonger, a deli, some great tavernas, restaurants and a couple of modern bars. Situated in the traditional hilltop village of Peyia with breathtaking views of Coral Bay, giving you the best of both worlds. There are fans in every room, but also aircon units in both bedrooms and Lounge. These can all be activated for £50 per week in total to cover the cost of it. 1 bathroom. 1 shower. 1 separate WC, mirror etc. Dining area: Seating for 6. Oak table and chairs. Entertainment: Sony Bravia LCD 32 inch TV! DVD player, Radio, CD System. Vast DVD collection (see our main website below for details). Cooker, hob, microwave, fridge, freezer, washing machine and iron. We love our own local food in our own time + enjoy eating with a nice bottle of wine on the balcony. Hence you will find everything you need for a great night (+ meal) in. Skiing in Winter in Tsada mountains - not sure how long to drive there! Less than 30 mins drive away is Tsada Golf Club which offers 18 holes of Championship Golf set in the grounds of a 12th Century monastery. There are also the Aphrodite Hills golf course and the exclusive 18 hole Championship Secret Valley Golf Club both within 25km. Notes on accommodation: Children welcome. Sorry - no pets allowed, sorry - no smokers. Outside: Large communal pool and Jacuzzi, undercover parking, balcony, garden furniture. Patio furniture on both balconies (1 pool view - sunrise, 1 sea view - sunset) with 6 private sunbeds provided. Utility Room: Not required due to huge kitchen area. Cleaning / Towels / Linen / Maid service: Towels/linen included for all - but NOT beach towels. Property cleaned on arrival/departure though option of mid-holiday linen change. Other: Option of air conditioning, house linen, towels provided. Family/child friendly apartment: the apartment has been set up to cater for our own baby and you will have use of a highchair and a cot, etc. Ceiling fans in all rooms with air con optional. absolutely beautiful, very clean, tidy and everything we needed. This was our first visit to Cyprus, The location of the apartment was good although a car recommended especially to enjoy local areas, The Apartment was as exactly as described and very suitable for a relaxing stay, with everything at hand within and around, we enjoyed having two balconies to get the most from the sun. We didn't get to use the pools on this occasion as we had family staying near by and visited their villa, but the area was clean and well maintained we would have had used the pools had we stayed longer which we wished we could have. The people were so friendly and unfortunately on our first day our grandson was in pain with his ear, we were looking for pain relief, in Coral Bay, and asked in a supermarket, were told they are not allowed to stock, Pharmacy was closed as Bank Holiday,The lady working in the shop said she is going to town now, the pharmacy there will be open I could pick up some Paracetamol for you, we said we would go, but she insisted as she had to go anyway, which she did and rang us when she returned, we were so very grateful for her kindness. We enjoyed visiting Coral Bay area and beach,along with Paphos Harbour, a lovely place, we really enjoyed a submarine type boat trip great for the children as well as adults, called Atlantis, and managed to see turtles and stingrays, with persistence of the skipper who hunted well for us, even though quite early in the season, The crew were very friendly and informative. The local restaurants and even those not so local were all enjoyable and we can't complain about any place we visited as all very friendly. We visited Polis over the mountain and Latchi which was full of history both recommended to visit if you can. In all we enjoyed our stay and would 100% recommend for a relaxing and adventurous holiday, everyone that was in our party all different ages, would return to Cyprus. We would like to Thank Jon and Rachel for the use of their lovely apartment and their input and all the information given, very nice genuine people. Cy Dive: Cydive is the longest established dive school in Cyprus and, although it has grown in size over the last 25+ years, it is proud to maintain its reputation as professional, friendly and helpful. Catering for experienced and novice divers, the complete beginner, singles or groups and welcome non-divers on all dive trips. watersports/waterpark. Horse Riding. Numerous walks & cycle rides. We are 5 mins drive from Coral Bay/beach, though it is down a large hill (see photo from our balcony). In Coral Bay there are loads of restaurants, bars etc. 35 minute drive from Paphos airport. Car hire recommended though we have English friends who can pick you up and drop you off. 5 mins walk from Peyia village: a traditional Cypriot village with a baker, a butcher, a fishmonger, a church, 3 supermarkets & some great restaurants, bars & tavernas. 5 mins drive from Coral Bay where there are loads of restaurants, bars & things to do. Coral Bay is a 600m crescent of soft white sand. 25 minute drive from Paphos which is the livliest resort on the west coast. In Peyia, we recommend Savvas, The Peyia Tavern, Sophies, Fito's take away, The Mill, The Jail bar and the local deli. In Coral Bay there are loads of restaurants, bars & things to do, but we sampled Siriani which was great, and the new Japanese restaurant on the main Coral Bay strip. Coral Bay is a 600m crescent of soft white sand. However, it's the glassy waters offshore that everyone comes for. While the sea is calm year-round the same can't be said of the beach, where you'll find every conceivable activity from banana boat rides to jet skis for hire. Coral Bay is also home to some great bars and restaurants. Also a short drive away is the popular resort of Pafos with its marina and numerous bars and restaurants.